Unless you are a teetotaller, who does not like a good brew, be it a regional Lager, Pale Ale or a Craft Beer with more exotic ingredients? Right –so how about taking it one step further, i.e. brewing it at home and bottling your own idiosyncratic batch of liquid goodness? Beer luminary extraordinaire Christopher Sidwa to the rescue! Christopher Sidwa has the ideal credentials to give advice on how to get things started and going. Being one of the spearheads and founders of the local, wildly Batch Brewing Co., an entity that we had the pleasure of recently visiting for a feature as part of our on-going Thus Let Us Drink Beer series, Christopher takes you by the hand and gives detailed tested and tried information on how he started his own empire and how yours cold stake its first baby steps. Sidwa also provides nuanced input on the nitty gritty of brewing with elaborations on assuring that your batch is on track via hints on approaches to tasting. Drawing on his vast experience and not shy to point out mistakes beginners are prone to make, because he has made them as well, you can avoid them by referring to the resource he has created. 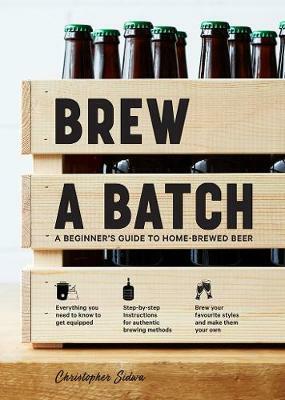 Batch A Brew is accessible for novices and what makes it an engaging read is that Sidwa manages to even infuse the drier theoretical and scientific parts of the genesis of beer brewing with enough liveliness to give an impulse to do more research. A guidebook from a craft beer manufacturer that, having originally started as a home brewer, has accomplished the creation of his own brewery that apart from its core range is very much focused on both experimentation and explorations of exotic flavours., and hereby bestows the gift of his passion for everything beer related on you.